Corporate earnings are growing at a double-digit rate, yet halfway through the year the S&P 500 posted a meager 2.6% return. Obviously, just because earnings are rising sharply, there's no guarantee the market will go up in lock-step fashion. But investors may be a little surprised at the size of the gap. After all, strong earnings growth (thanks to an improving economy and recent corporate tax cuts) continues to be a huge tailwind for stocks. Yet, the prospect of higher interest rates and inflation plus trade and tariff concerns are growing headwinds causing price/earnings (P/E) multiples to contract. How strong these forces become remains to be seen. 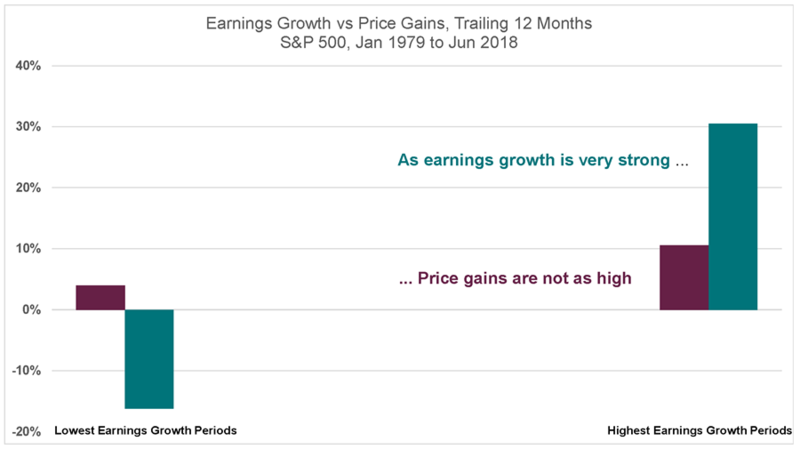 Also, importantly, there tends to be a relationship between the level of earnings growth and price gains that can surprise some investors. As the right-hand columns of the chart below illustrate, when earnings are growing strongest, the P/E multiple tends to contract, resulting in stock price gains that, while still solidly positive, are far less than the earnings increase. The larger price gains have typically occurred prior to the acceleration in earnings. For 2018, consensus estimates (per Bloomberg) forecast S&P 500 earnings will grow by 20%+. If history is a guide, price gains will likely not reach this level. Thankfully, the opposite holds true as seen in the left-hand columns. When earnings are falling, the P/E tends to expand, cushioning the blow. Stay tuned to see which way the winds blow in the second half of the year. Also, stay tuned for our next quarterly Investment Perspectives newsletter – out in a few days. Very helpful articles on tax reform and saving for retirement. Plus, a column on Bitcoin and other cryptocurrencies. I don’t think we have ever written on this topic, so definitely worth taking the time to read. 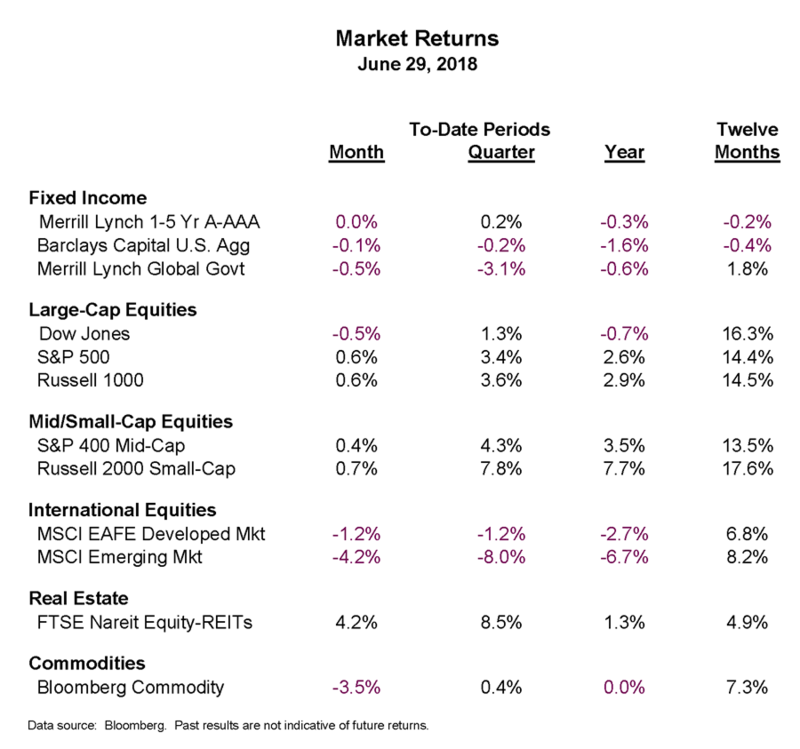 June returns were mixed with U.S. equity returns up modestly. International equities were generally down based upon trade and economic growth concerns. Fixed income returns were also slightly negative for the month due to marginally higher interest rates.